Upon completion of child preparation services in her late teens, Michelle Nauman-Brown received the gift of a video “life book” from her social worker, Lisa Richards. The life book told such a compelling and enlightening story that Family Design Resources asked for permission to borrow it on multiple occasions. Brenda Lawrence, executive director of Family Design Resources, recounted that anecdote on May 27 at an event marking the premiere of a seven-minute video. It's called "Michelle's Story," and, picking up where Michelle’s life book left off, it describes how she has triumphed over long odds. Today, Michelle, now 25, is a youth advocate for Family Design Resources, encouraging foster youth to learn from her story and touting the importance of permanency in their lives. “Michelle’s Story” is a collaboration of Family Design Resources and JPL, one of the Mid-Atlantic’s largest full-service marketing agencies. 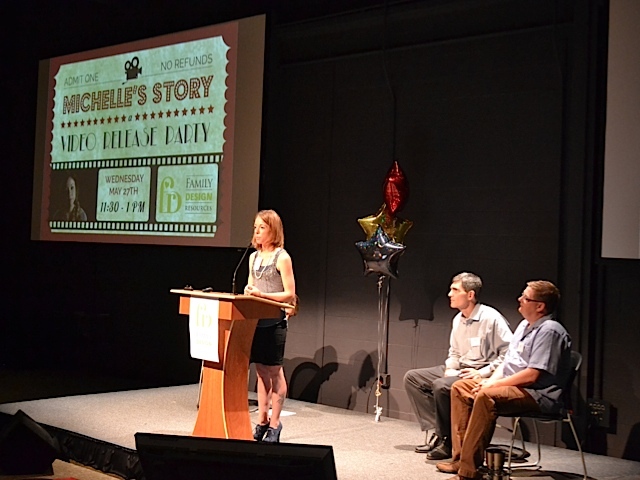 JPL’s media center was the setting for a video release party, complete with a keepsake “Michelle’s Story” movie ticket. Sharing table space with take-home boxes of Junior Mints and bags of microwave popcorn was a box of tissues, in anticipation of the emotions that “Michelle’s Story” would summon in viewers. “Many years ago, I chose to work in the communications industry because I wanted to tell compelling stories, tell stories that moved the audience to action, stories that made the world a better place,” he said. He introduced Michelle, who was joined at the event by her husband, Scott Brown; her daughter, Braylynn, 6; and son Jeremiah, who will turn 2 in June. Michelle said her journey had come full circle, adding a detail that is not part of the video. She and Scott are close friends with Scott and Wanda Carter, who live near them in Bradford County. The two Scotts met in the Air Force Reserves and work together in civilian life. At the end of June, the Carters will formally adopt Michelle.